In November, the TTC board decided to raise fares for 2014 by approximately $60/year for people who buy metropasses every month. Many have already noted that this amount is the same as the $60 VRT that Mayor Ford and Council repealed early in this term. Quite plausibly, this is a regressive tax transfer from a form of taxation that falls more heavily on wealthier residents (e.g. those with cars) to one that falls more heavily on poorer residents (those reliant on the TTC). As the TTC is already one of the least subsidized and most expensive transit systems around, it is reasonable to ask when and how a major subsidy increase for the TTC from Toronto's general revenue could ever be funded? Toronto is Canada's 6th largest government (by both population and government expenditure) and has no formal means of levying progressive taxation on its better off residents. The City of Toronto Act gives Toronto a few extra taxation powers that other Ontario municipalities don't have, and yet none of these can be explicitly progressive. In particular, the act explicitly prohibits property taxes (Toronto's top source of revenue) from being anything but flat-rate. Why should this be so? Numerous countries and municipalities which employ property taxes have already implemented mechanisms to explicitly make them progressive in nature, meaning roughly that the most expensive properties are taxes at higher rates than inexpensive properties. Ireland, still suffering severe after effects of the global economic crisis introduced a national progressive property tax in the 2013 budget. Denmark, Finland & numerous other European nations have progressive property taxes. Taiwan came close to implementing one in 2010. This may be why they backed off. Some argue that property taxes can be broken into seperate components for the land value and the building value, which helps tax large lots and in particular large lots in high land value areas more steeply, even without scaling rates, this becomes progressive. Misunderstanding of progressive taxation is quite common. In the realm of income tax, it is not difficult to find people who believe that if they get a raise that bumps their total income into a new higher tax bracket, they will end up worse off after taxes because they think their whole income gets taxed at the higher rate. This is not how escalating bracket rates work. Only the portion of your income above the threshold is charged at the higher rate. 1800 + 500 = 2300 euros. If the second house paid 0.25% on the whole value of the house, that would be 3000 euros. Instead, the house worth twice as much pays 2.12 times as much property tax. That .12 is the progressive part. No one need hold off renovating their 950,000 euro house because it will cross the magic value threshold and dramatically increase their tax burden. Is why the politics of property tax increases are as contentious as they are. Many of the people in the brown sections are hurting. Even if they're renters, some amount of property tax increases flow through to them, and for those who own in lower and low-middle class neighbourhoods, property tax increases hit them hard. Many quite legitimately feel they cannot afford higher taxes, and are not just grousing, it actually materially affects their lifestyle. It even forces some out of their homes. Like Toronto's other mostly flat taxation powers, the problem is that flat taxes max out at the realistic ability to pay of the least affluent people subject to them. Yet many others above that level have the means to pay more, but this can only be achieved with progressive rates. 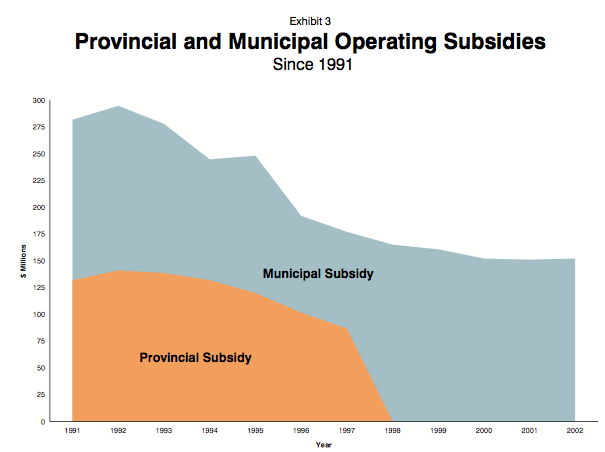 In the past this awkward reality was "squared" by contributions from the Province, who can and does have explicitly progressive taxes, but they're proving less willing to pay their share over time. Rather than assume trends like this below (chart refers to the TTC) will reverse themselves, Toronto should act to address its needs and not wait for the fairy godmother to re-appear. Singapore provides an example of another advantage here, by introducing a progressive property tax structure that cut taxes on lower valued properties while increasing taxes on the high value ones. Not only can we charge more from those who most benefit from the city, but we can give those more likely to find each day a struggle a break. A final advantage worth mentioning is that it is administratively very simple to do, since the city already has a property tax collection, assessment and enforcement system in place. Unlike setting up fun and exciting new forms of taxation like road tolls or sales taxes, which need things like infrastructure and whole new departments of staff to run, this would only incrementally increase the work effort of the existing property tax staff. Toronto already charges different rates for different types of property (including a regressive higher rate charged on multi-unit apartment buildings that mostly falls on low-income renters once passed along by the landlords), this is logistically very easy to do. The province would need to amend the City of Toronto Act to allow this. They should, particularly if Toronto City Council asks them to. Toronto has an elected government, why should it not have the same capacity the Province does to decide that wealthier citizens should bear more tax burden? Virtually every other tax in Canada is at least somewhat progressive, even the GST has rebates for low-income Canadians. Why should municipalities not have this power? Premier Wynne is currently searching for "revenue tools" to fund transit. Keep searching, but give Toronto increased taxation powers as a mature order of government (Ford notwithstanding) - something the province has already acknowledged in the 2006 Toronto act, which granted the city extraordinary powers that other Ontario municipalities do not have. This is just a concession to reality: Toronto is Canada's sixth biggest government, if it cannot "handle" these powers, we'd better amend the Constitution to take these powers away from the five smallest Provinces too. Up until now the City has basically been waiting for higher orders of government to fund these things. A progressive property tax need not preclude that, but it would allow the city much greater flexibility to move on these items on its own, and ask the Province or Federal government to contribute to an in-progress plan which the City can lead, rather than spend months or years careening back and forth between the levels trying to work out a financing deal for any major project. Toronto needs progressive property taxes. Like this? Please click here vote for it on Progressive Bloggers. There's still some confusion about this. Ford is the incumbent. He has as close to 100% name recognition and voter awareness as any politician can possibly attain. Short of people who have particular mental illnesses or who purposely avoid all news, it's difficult to imagine any potential voters in the city who aren't aware of Ford and have some opinion on him. The challengers are just that: Challengers. Unknown, untried. That at least two of them (I'm assuming Chow will challenge) can already beat Ford in match ups even with multiple other vote-splitting candidates left in, is very bad news for an incumbent. Basically, voters have already decided against Ford, they just haven't yet finalized who they want to replace him with. That means the initiative in the campaign is all with the challengers. It almost doesn't matter what Ford does or says. Everyone knows him, almost nothing he does now will change many minds about him (hence desperate stunts like going on Kimmel). But the challengers can either make or break themselves in the campaign. If they all manage to break themselves, Ford can possibly be re-elected with some kind of plurality vote (I'm prepared to predict he cannot get a popular vote majority). If. This is a terrible position to be in as the incumbent. It is not hopeless, defeat is not certain, but his victory is dependent on several others failing. “Here’s the thing: nobody cares about those old labels of left or right and liberal and conservative. Is removing the snow a right-wing or left-wing idea? Is fixing the potholes more New Democrat or Conservative? It’s ridiculous,” he said. This is very unpersuasive. It isn't hard to find libertarians who disagree with the ideas of having the state tax its citizens to provide & maintain public roads or plow those roads during winter. Are such people a significant political force on the municipal scene? No. But then all Nenshi is saying that the politically potent forces agree on these particular ideological questions. Even so, you can find plenty of left/right division in the details: Should the workers providing these services be government employees or private contractors? Should sidewalks be plowed? Should homeowners be responsible for shovelling & fined if they don't? etc. Further, Nenshi here has (cherry) picked two quite settled matters of debate. That the contemporary left and right mostly agree about these two things hardly means the End of History and agreement on everything else City governments might do. Nenshi himself, who has been targetted by right wing forces in Alberta for his urban centric policies must know this. Try asking conservatives whether public transit should be a subsidized public service or a for-profit business. Or whether city governments should provide free or subsidized services for their residents from pools to libraries to parks, homeless shelters and sporting fields. Ask whether urban planning should preference mass transit & higher density construction or sprawl & car-centric roads. Ideological divisions abound once you stray from the easy matters of largely settled issues. The general positions that left and right take on these issues can be relatively easily derived if you understand what the division of "left" and "right" mean. The labels themselves are arbitrary, a throwback to the French pre-revolutionary parliament. We could call them "coke" and "pepsi" or "dogs" and "cats" - but the underlying heuristic employed by each camp does not tend to vary much across cultures or time periods. It's not an accident that these labels have survived centuries & crossed oceans intact. If you understand what drives the right, you can then understand why say, they want car-centric sprawl and public services minimized. The eternal cry for "smaller government" applies just as much to municipal government as national ones. The basic cleavage is this: The left seeks to enlarge the circle of human compassion, and the right seeks to shrink it. There are other ways to express this, (you can state that the left seeks greater equality and the right greater hierarchy) but this basic division underlies the policies positions on specific issues taken by "liberals" and "conservatives." This does not mean necessarily that people on the left and right think of their positions as such, in these terms (or even consciously), but the high consistency in finding these cleavages on such a disparate set of issues as handled by the modern municipality it not a mistake. How is that Relevant to Municipal Politics? One objection might be that municipal politics are "low-level" nuts-and-bolts issues that should not really concern people concerned with the high questions of the human condition. But of course this is untrue. Who needs reliable, affordable and timely public transit more than the poor? What decides which communities the poor can afford to live in more than municipal policy? Whether you live in a violent slum or a safe and healthy neighbourhood are largely decided by things like land zoning, provisioning of parks, and how the local schools are funded. I'm sure some issues exist that don't easily translate into grand questions of social equality, but whatever their prevalance, municipal policy affects such questions in important ways. Nenshi doesn't use the word (and even mixes in partisanship by referencing political parties) but that's really what he's talking about. It's important to spend a few words defining "ideology" - never mind whatever dictionaries say, ideology usually has a derisive meaning when used, and you frequently see people trying to dismiss someone else's ideological position in favour of their own ideological position by labelling it as such. Typically anything that challenges universally accepted ideas is "ideology" but those universal ideas are not understood as such. Much like "treason", ideology doth never prosper. So what is it? Ideology is your heuristic means for understanding how the world works. It is a set of beliefs, both conscious and unconscious about how people behave, what is right and wrong, and what is the "good life." Are you pre-disposed to think people are basically honest and will behave ethically with minimal supervision, or that they're dishonest and require monitoring and enforcement to behave themselves? What do think "right" and "wrong" mean and are decided? The Bible? Utilitarianism? Your ideology decides how you address these. None of this is to say that all ideological beliefs are empirically or ethically equal. Evidence matters (says my ideology, at least!). Our heuristics may lead us to think that say, lowering taxes improves economic growth. Does it actually do so? This is an empirical question (to the extent reliable empirical tests of large numbers of people can be accomplished and accurately measured). Nenshi is rejecting ideology. That belief is, itself, ideological. How do you know? Well if my disagreeing with his ideology isn't enough, let's ask what empirical proof he can provide to prove me wrong? Two sample consensus issues in a universe of divisive ones? “If we went on to Bay Street today and asked 100 people, ‘Are you left-wing or right-wing?’ I guarantee you, 85 of them would have no idea what we were talking about and 11 of them would answer incorrectly. And the rest would be John Tory.’” he said, to wild laughter. This is also weak. First off it is an argumentum ad populem fallacy. That most people might have trouble placing themselves on a left-right axis doesn't mean one doesn't exist, it just means many people don't think very much about ideology. Why should they? But at a deeper level, most of those people will be relatively easy to place on such a spectrum if you actually query them on their views of various issues. Yes, there will be iconoclasts who are difficult to place, and most people have an issue or two in which they differ from their otherwise prevailing ideology. By and large Nenshi's 100 will divide fairly predictably. This is an empirical result of psychologists quizzing thousands of people on moral questions and finding wide agreement on the moral issues liberals and conservatives found more important. The ethical bases of liberals and conservatives are different in significant and persistent ways. People may widely believe they are not ideological, but that doesn't make it true. We should think about the harm this does. The biggest harm is that ideology that is not understood as such is the most dangerous kind. These are the kinds of beliefs that are the most difficult to challenge and change when evidence mounts that the belief is not working. Those of us who admit our basic ethical systems are ideological and that those systems guide our beliefs about what even municipal governments should do, and how they do it are at least conscious of these choices. Those who treat their ideolical beliefs as "self-evident" or "common sense" are the least apt to accept evidence to the contrary. The other major harm is that it makes a negative out of the highly necessary process of democratic disagreement and debate. Challenging ideology is the surest way to ensure only the best ideas win out. Many of the worst debacles started with unanimous or overwhelming supermajority votes. Many of the most cherished and successful government programs started in strife over vehement opposition. I realize Nenshi did not explicitly say so, but you frequently see this kind of talk followed by calls to "move past" the old divides and "work together to get things done." Whenever you hear someone say that, ask "get what done? How? Why is that thing something that should be done?" You will quickly see ideology at work. We cannot "work together" on common goals unless we have those goals in common! We cannot agree on means to achieve those goals unless we share enough ideology to agree those means will achieve the agreed ends, and further that they don't have ideologically undesirable other effects which outweighs our desire to achieve that agreed goal. An example may help bring this last, crucial point home. Let's leave the field of road maintanance and talk about poverty reduction. Left and right will both tell you (usually) that they agree reducing poverty is a noble goal. Great. But how? The left supports policies like a minimum (or "living") wage, income support programs paid for by progressive taxation, free public education up to and including post-secondary, etc. The right generally opposes these things, and proposes freedom, choice, deregulation, private enterprise personal responsibility and negative disincentives to poverty (e.g. that you'll starve in the dark if you don't work will incent you) to reduce it. They may or may not support private charity intervening, funded only by voluntary donations. To the extent they support government helping out, they want strings attached, from drug tests to "workfare." The differences between these approaches cannot be papered over. In fact, the differences are so vast, and the empirical results of right wing approaches so apparently counter-productive that most on the left conclude that the right's support of the basic goal is not an honest representation of its views. That it is disingenuous. Whatever, not going to settle this here, but the point is that you cannot wipe away these vital debates over both means and ends and get to some magical place where we all agree on what and how we should be doing. None of the above is to say that one should consciously self-identify with the "left" or "right" and then adopt the positions of that tribe for the simple reason that they are the tribe's beliefs. That's partisanship, and a very different matter than ideology. If that were all Nenshi meant, fine. Great. Of course it is better if people arrive at their policy positions by individual thought, and even desirable that intra-ideological debate occur. What "liberals" believe is not a fixed and eternal quantity. It can and should change as new evidence arrives as to the results of previous real world policy experiments. This in fact has already happened, with the major shift of 19th century liberals away from laissez-faire capitalism and toward mixed-mode social democracy. That liberals today believe in, say, the minimum wage, should not mean they must always believe such. A sufficient quantity of quality evidence showing that policy is counterproductive to the underlying goals of liberalism should change the beliefs of liberals. If it were just Nenshi, one politician saying such things it would not be worth replying at such length, but as he himself says, such beliefs are common and receive applause when expressed. No one wants to be one of those silly ideologues who are closed minded and unreasonable. Except the aversion to recognizing your own ideology as such is about as ideological as it gets. I would infinitely prefer an honest debate between ideologues to one in which some are pretending to be above ideology, claimants to the one, true, pure nature of the world. [Former B.C. Chief Electoral Officer Harry Neufeld] says Section 44 of the government’s new legislation would allow all central polling supervisors to be appointed by a riding's incumbent candidate or the candidate's party. What could possiblay go wrong with such a well conceived scheme? The government's answer? But a spokeswoman for the minister of state for democratic reform says the Elections Act already allows for candidates and parties to appoint other polling station officers. "This is the case for revising agents in s.33, deputy returning officers in s.34, poll clerks in s.35 and registration officers in s.39 of the existing Canada Elections Act," said Gabrielle Renaud-Mattey. Renaud-Mattey also points out that the idea was recommended by the Commons procedure and House affairs committee and that the returning officer can refuse to appoint the central polling supervisor recommended by the candidate or party. Nowhere in here do we see an actual reason for doing this. That other elections officers might be picked in a similar manner doesn't tell us whether this is a good idea. The CPS is the chief official at each polling facility, overseeing however many deputy returning officers (who run each individual "poll") there are, as well as more general issues to that site. Whatever the merits of letting the incumbent party pick the DROs, having the whole operation overseen by a non-partisan appointee who reports to Elections Canada (and owes nothing to the local incumbent party) is self-evidently wise. That a commons committee dominated by Conservative MPs recommended this is similarly unpersuasive. The Chief Electoral Officer proposes to amend the Act to authorize returning officers to hire additional election officers in situations where the Act does not grant this power. In the last general election, the CEO used his power of adaptation of the Act to enable returning officers to hire additional election officers including poll clerks, registration officers, information officers and central poll supervisors. These additional election officers were required mainly for advance polling stations. The authority to hire additional election officials has been necessitated in recent years by the increasing voter turnout at advance polling stations. The Committee, however, raised a related issue in the course of its consideration of this recommendation: permitting candidates or electoral district associations to nominate those individuals who may be selected by returning officers to perform the functions of central poll supervisors, given the important role played by these officials. Wait, what? What is the argle bargle reasoning here? It's almost completely non-sequitur to the issue Elections Canada raised (the need for more officials), and the logic is baffling: "given the important role played by these officials." Yes, the role is important, why does that make partisan control a good idea? The whole raison d'etre of having a thing like Elections Canada is to ensure the government of the day cannot easily manipulate election outcomes. Everything that moves away from that goal must be viewed with extreme skepticism. This isn't quite Katherine Harris giving the 2000 election to George Bush, but it's a couple steps in that direction. It is true the Returns Officers (still picked by Elections Canada) can reject particular nominees under the proposed changes, but that puts the onus on Elections Canada to find reason to reject specific individuals. The practical reality is this won't happen very often, as most partisan shenanigans will tend to fly under the radar, and is entirely reactive to people who have behaved in sufficiently egregiously partisan ways while acting in election oversight capacities. Even relatively honest people so appointed are now aware their role as CPS is a result of the incumbent party picking them, so their loyalty goes that way, rather than to Elections Canada. If they want to be picked again (or have other ambitions in that party) they will need to do a "good" job by the party's reckoning. I realize nearly everyone working on elections has personal opinions and many may be loyal party members, but that is still materially different from getting your election job as a result of partisan loyalty. It's safe to assume the people picked will not be picked because of their ability to run a clean election as the top criteria. In what I am sure is an unrelated matter, the Committee supports increasing the pay rates for Elections workers & officers. What's doubly alarming is that neither the NDP or Liberals, who have representation on this committee dissented over this point. The NDP's report only disputes 3 unrelated issues, and the Liberals didn't seem to even issue a dissent. I hope I am missing some great countervailing control that makes partisan manipulation of election conduct still a very difficult and risky proposition but I'm not seeing any merits in this. At the very least it just creates a system of partisan patronage, even if the people picked do their jobs with reasonable honesty, the prospect for graft is real. I doubt most Canadians will know that when they go to vote in 2015, all the leading officials at their polling place are partisan picks. It certainly changes how I view the process of voting, and undermines confidence in the system.